3. Place the dough on a piece of parchment paper and roll in with a second piece of parchment. 4. Prick with a fork on top and sprinkle sea salt. 5. Cut to square pieces and bake at 350° for 20-25 minutes till brown and done. 6. Let it cool and store in airtight container. My daughter Nikita made this Cauliflower pizza crust adapting the recipe from the Food Network. 1. Pulse the cauliflower florets in a food processor to make it rice consistency. 2. Steam the cauliflower for about 5 minutes. 3. Drain the water completely with a cheese cloth. 4. Mix the beaten egg, a cup of mozzarella cheese, salt and seasonings. 5. Put this dough and spread on a parchment paper on the baking sheet or pizza stone. 6. Bake it at 425F for 15 to 20 minutes till golden brown. 7. Remove the crust from the oven and top with mozzarella cheese and the choice of veggie toppings. 8. Sprinkle pizza seasonings and bake for 10 more minutes till the cheese melts. 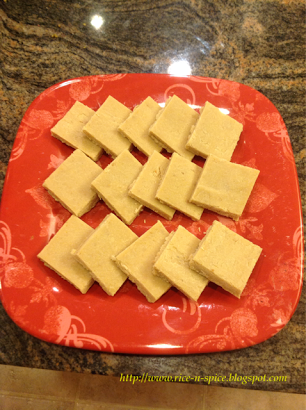 Sandesh is a Bengali dessert made with paneer. 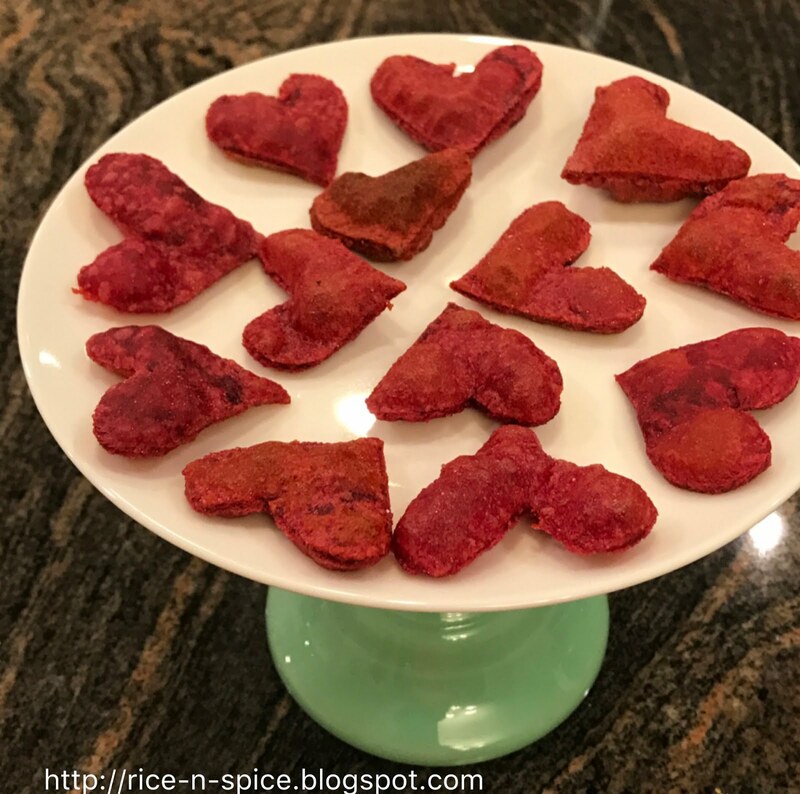 I tried this recipe for Valentine's Day adding rose flavor and color. 1. Boil the milk and curdle with lemon juice or vinegar. 3. When all the water has drained knead the paneer to make it to a smooth paste. 4. Add sugar, rose flavor and color. 5. Make balls, add saffron strands on top and steam for 10 minutes. 6. Garnish with pistachios and rose petals. 7. Cool it in the refrigerator before serving. 2. Add condensed milk, evaporated milk, cool whip, color and essence and gently fold in. 3. Pour in orange cups and freeze for 5 to 6 hours. 4. Decorate with orange slices. 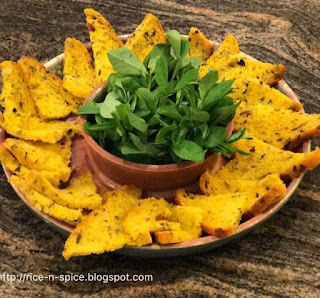 Chakli is a savoury snack made from rice flour, roasted gram dhal, black gram dhal and spices. 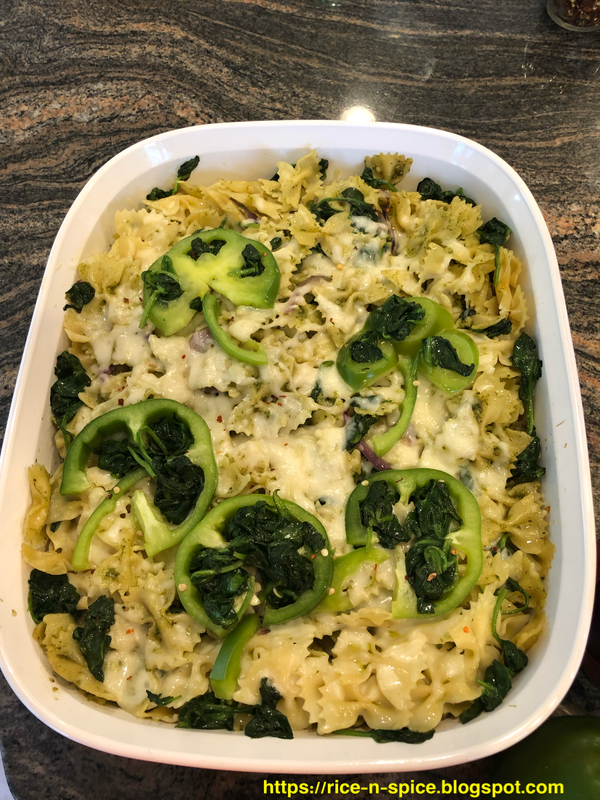 I used fresh spinach and green chillies to enhance the flavor. 1. Mix all the flours and add asafoetida and salt. 2. Add butter, blend spinach and green chillies and knead to a smooth dough. 3. Make spiral chaklis with the chakli maker. 4. Deep fry till done. 1. Take fine semolina, all purpose flour, salt and turmeric powder in a bowl. 2. Combine everything adding water gradually to make a soft dough. 3. Add some oil and knead. 4. Put some oil on top of the dough and cover it and rest it for a couple of hours. 5. Finally knead once again soft and loose dough. 1 . Blend the dates with as little water as possible. 2. Add coconut powder and blend dates cardamom and cook in a non stick pan. 3. When it thickens and leaves the pan turn off the heat and let it cool. 4. When completely cooled make lemon size balls of the stuffing. 1. Make balls of lemon size with the dough. 2. Place the stuffing in the dough and seal it. 3. Roll or press it to a thin disc of 5 inches on a plastic sheet. 4. Transfer the rolled holige to a heated non stick skillet and cook on both sides on medium flame. 5. When the brown spots appear they are done. I tried making the pizza crust healthy by adding grated carrots and beets to add more veggies in the diet. It was surprisingly very tasty. 1. Disintegrate yeast and sugar in luke water water. The yeast will rise. 2. Make a well in the flour and add the yeast mixture. 3. Gently add the grated veggies and salt and oil and knead to a soft pliable dough. 5. Punch down the down and stretch it and place on a pizza stone and let it rise. 6. Apply pizza sauce generously. 7. Cover with mozzarella cheese and drizzle some olive oil. 8. Top with vegetables of your choice and bake in the over at 425F for about 15 to 18 minutes. Methi (Fenugreek) is a herb and the seeds and leaves are used in Indian cooking. This herb is highly beneficial to health and has medicinal value. I tried to incorporate this in bread and the taste and flavor of this bread was amazing. 1. Add all the ingredients for the bread in the bread machine in the order given above. 2. Set the bread machine to mix bread cycle. 3. Start the bread machine. 4. Make sure the dough is a soft elastic ball, if necessary add a tsp of flour if the dough is sticky or a tsp of oil if the dough is tight. 5. When the machine beeps add the chopped onion, methi leaves, cilatntro, curry leaves, chopped green chillies and grated ginger. 6, Cool completely when done and slice. Avalakki (flattened rice) upkari is a popular breakfast item or evening snack. It is served for breakfast with upma and banana. 1. Dry grin cumin seeds, coriander seeds and red chilies. 2. Add the grated coconut to the poha and mix. 3. Add the powered spices, jaggery/brown sugar, and salt. 4. Head the oil, add mustard seeds and when it sizzles add asafetida, curry leaves, and turmeric powder. 5. Pour the seasoning on the avalakki. 6, Garnish with fresh chopped cilantro leaves. Chakli is a popular savoury snack. It is made with rice flour, roasted gram flour and urad dhal flour mixed with butter and spices. 1. Mix all the flours and add asafoetida, cumin seeds, sesame seeds and salt. 2. Add butter and water to mix and knead to a smooth dough. This year for Valentine's Day I tried making chapati with beets. I steamed the beets and blend in the dough and later cutting into heart shaped pieces and infusing with the dough. 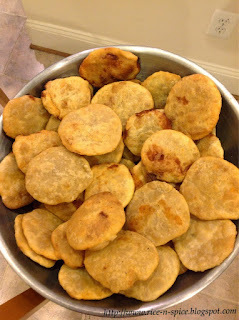 I also made mini puris. 1. Mix the ingredients for the plain chapati and make a soft pliable dough. It should be elastic, soft and smooth dough easy to roll. 2. Blend the steamed beets, and green chillies with very little water and add this to the other ingredients the wheat flour and salt. Make a smooth and soft dough. 3. Roll the beets chapati dough thin with a rolling pin and cut out the desired shape with a sharp knife. 4. Roll the plain chapati dough to a cirle. Place the cut out shapes of the beets chapati dough and gently roll so it fuses with the plain chapati. 5. Place it on a hot griddle and cook. Apply oil and cook and flip to turn to cook on the other side till there are golden brown spots. 6. When it is cooked keep it covered in a container. Our family moved to Southern Maryland in 1997 but we lived there for less than a year before we moved to Northern Virginia. During my time there I had the opportunity to work as the Curriculum Specialist at "The Seafarers Harry Lundeburg School of Seamanship" for about six months. This was the most fun job that I have ever had and it was a wonderful experience! I enjoyed gourmet lunches every day as I updated the school's website with recipes, menus, and an online cookbook for chefs embarking on a seafaring career. It was there I met the Director of Culinary Education, Chef Allen Sherwin who gave me so many recipes and tips on baking and cooking. He gave me this recipe for Corn Bread and since then it has always been a family favorite! 1. Mix corn meal, flour, sugar, baking powder together and sift. 2. Mix eggs, milk, melted butter together. 4. Mix all ingredients together. Do not overmix. 5. Bake in a greased pan or muffin tins at 425F for 20 to 30 minutes till toothpick comes clean. Black forest cake is originally a German dessert literally "Black Forest cherry-torte". It is a chocolate sponge cake with layers of light whipped cream and garnished with grated chocolate and cherries. 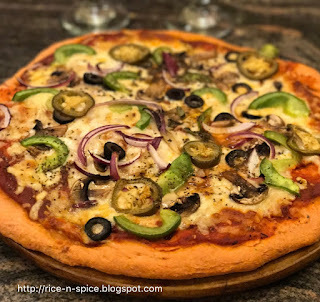 This recipe is the Indian eggless version which I had from awhile ago which I tried. 1. Combine condensed milk, sugar, melted butter. 2. Mix the all purpose flour, cocoa powder, baking powder in a bowl and add to milk, sugar & butter. 3. Add the coke and beat on low till there are no lumps. 4. Bake in 2 cake pans at 400F for about 20 minutes till toothpick comes out clean. 5. Level the cake and let it cool. 1. Beat the whipping cream and sugar with a hand whisk or kitchenaid mixer whisk attachment till it form peak. 2. To make simple syrup add 1/3 cup sugar and 2/3 cup water and boil. As soon as sugar melts turn off the heat and cool it. 1. Drizzle the simple syrup on the cake. 2. Spread whipping cream like sandwich on the two sheets of cake. 3. Using a star nozzle put the whipping cream on the top of the cake. 4. Sprinkle with grated chocolate. 5. Decorate with candied cherries. Jackfruit has a distinctive sweet and fruity aroma. I have tried many recipes with this fruit as I love the sweet and fruity aroma. 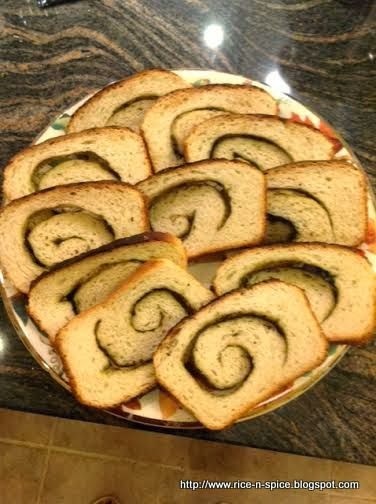 I tried making bread with it and it was a huge success with my family and friends. 1. Blend five pieces of jackfruit in milk. 2. Add the blend jackfruit, coconut milk, butter, brown sugar, cardamom powder, salt in the bread machine. 3. Add the bread flour and yeast. 4. Start the bread machine in the mix bread cycle. If necessary add a tsp of milk. 5. In the meantime chop the other five pieces of jackfruit. 6. Make sure the dough is smooth and elastic. 7. When the machine beeps add the chopped jackfruit, raisins, chopped nuts. 8. Cool completely and cut slices. Guacamole is a dip and made with avocado as the main ingredient. The other ingredients used in this are onions, hot peppers, tomato, garlic, lime juice and cilantro. This Mexican recipe inspired me to experiment with guacamole flavor bread. 1. Place sour cream, tomato chopped, avocado scooped, salt, sugar, lime juice, pepper powder, avocado oil in the bread machine. 2. Add the bread flour and yeast. 3. Start the bread machine in the mix bread cycle. If necessary add a tsp of liquid. 4. The dough should be smooth and elastic. 5. In the meantime saute the onions in a tsp of oil. 6. When the machine beeps add the onions, sun dried tomatoes, chopped cilantro, chopped Jalopeño. 7. Cool completely when done and cut slices. 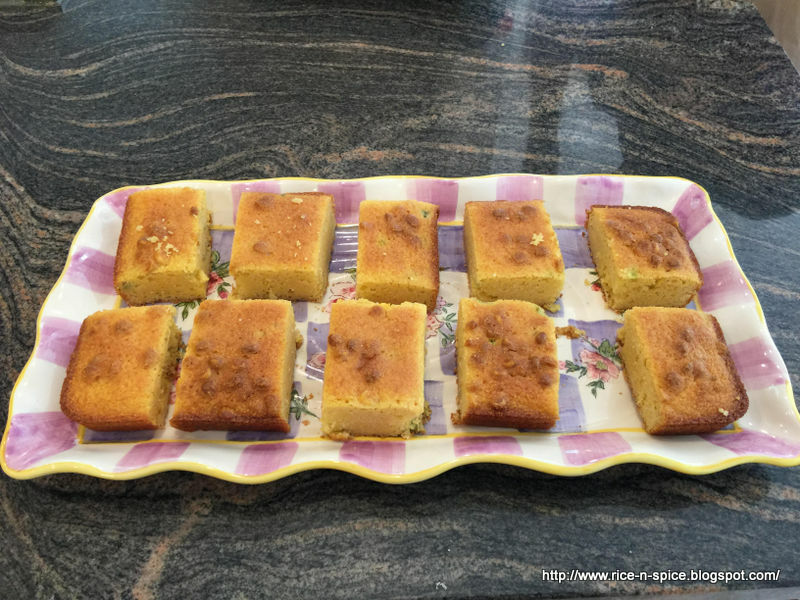 Sajjappa is a traditional Indian dessert. My mom was an expert in making this dessert. Unfortunately I did not get her recipe but I had seen her making it. I am using my friend Uma's recipe. She is an expert in making all kinds of savories and desserts. 1.Mix all purpose flour, turmeric, salt and hot melted ghee/oil to make a crumbly texture and the ghee/oil is spread on the entire mixture. Add water gradually. 2. Knead well for about five minutes till it is a soft and pliable dough. 3. Put a few tsps of oil on the dough and set it to rest for a couple of hours in a covered container. 1. Roast the semolina for a few minutes so the raw odor is not there. 2. Melt the jaggery in a wide vessel with a few tsp of water and when it melts strain the jaggery it to clean the dirt and boil a little and turn of the heat. 3. Turn off the heat add the roasted semolina, fresh grated coconut, dry coconut, cardamom powder. 4. Make lemon size balls with greased hands. If it is sticky cook for a minute more. 1. Heat the oil in a kadai on medium heat. 2. Make lemon size balls from with the dough and flatten it on a plastic paper and keep the filling and make sure to seal the edges completely. 3. Now flatten the dough with the filling inside to make sure the filling does not come out. 5. When the oil is heated gently slide the sajjappas in oil and fry both sides till golden brown on both sides. Chapati is a flatbread made with whole wheat flour and cooked on a tava (skillet). March 17th is St. Patrick's Day and for this occasion I tried making shamrock patterns with chapati dough and spinach mixed chapati dough to make it festive. 2. Blend spinach, ginger and green chillies with very little water and add this to the other other of ingredients the wheat flour and salt. Make a smooth and soft dough. 3. Roll the spinach chapti dough thin with a rolling pin and cut out the desired shape with a sharp knife. 4. Roll the plain chapati dough to a cirle. Place the cut out shapes of the spinach chapati dough and gently roll so it fuses with the plain chapati. 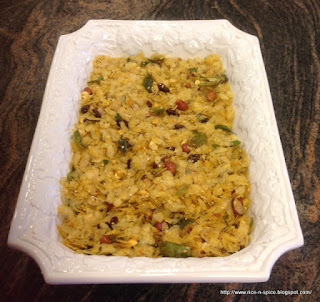 Custard halwa is a very easy to prepare dessert. I adapted this recipe from my friend on the "Foodie" group. 1. Take a pan, add in custard powder, sugar, and water. Stir well so no lumps are formed. 2. Keep stirring continuously on high heat till it is thick. 3. Add a tbsp of ghee and keep stirring..
4. After a few minutes add another tbsp of ghee and mix well. 5. It will get thick and not stick to the pan. Add in another tbsp of ghee. 6. When the halwa will leave the sides and the ghee oozes out add in chopped cashews, cardamom powder and mix well. 7. Spread the halwa on a greased pan and let it cool. 8. When it is set, invert the plate to a flat baking sheet or cutting board and cut to desired shapes. Poha Chivda is a popular snack of Bangalore. It is a healthy snack with a mixture of spices and nuts with sweet and spicy taste and easy to prepare. 1. Place the poha in the oven at 200 F for about two hours till crisp. 2. Heat oil and roast peanuts, cashew nuts, dry coconuts pieces, roasted gram, raisins, green chillies till crisp, curry leaves separately. 3. In the same oil add asafoetida, turmeric, mustard seeds, sesame seeds, and when is sputters turn of the heat and add chilly powder, salt, sugar, lemon juice, coriander cumin powder, garam masala powder, chaat masala powder. 4. Add this to the poha and mix. Adjust seasoning to taste. 1. Disintegrate yeast with a tsp of sugar in luke warm and rest aside. 2. Add bread flour, salt, sugar, butter, skim milk, yogurt and the yeast mixture and knead well. 3. Cover the dough with saran wrap in a wide mixing bowl. 4. Rest in a warm place for about 4 hours till it doubles in size. Alternatively, make the dough in the bread machine with the above ingredients in the dough cycle. 5. Sauté the chopped onions, dill and mix the curry leaves, coriander leaves, green chillies. 6. When the dough is double in size punch it down and roll the dough. 7. Spread the filling and roll it. 8. Make small balls and keep on a baking tray in a warm place for an hour till it doubles in size. 9. Glaze the buns with milk and sugar mixture. 10.When the dough has risen fully bake it at 425F for about 20 minutes. Pathrode is a delicacy of Mangalore. It is usually made with rice and Colocasia leaves. I have tried this recipe by substituting quinoa for rice and also used cabbage and spinach leaves. 1. Saute cabbage and spinach, Mix it with quinoa. 2. Blend coconut with red chillies, coriander seeds, cumin seeds, brown sugar and tamarind in 1 cup of water. 3. Mix it to the quinoa and cabbage/spinach mixture and add salt and 1 cup of water and cook on the stove till almost cooked. 4. Spread this mixture in idli plates or steamer plate and steam for 15 minutes. 5. Let it cool. Crumble the steamed patrode. 6, Make a seasoning of oil with mustard seeds, asafoetida, curry leaves and saute the pathrode. I had tried these Mangalore buns and goli bajji at a small restaurant called Mitra Samaj in Udupi. Ever since this has been on my mind. 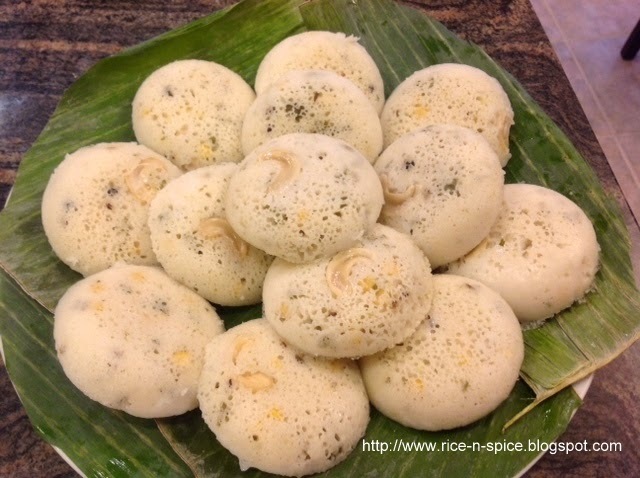 The Indian cooking challenge for March is Mangalore buns. 1. Peel, chop and mash the bananas and set aside. 2, In a dish add the mashed bananas, all purpose flour, yogurt, sugar, cumin seeds, baking soda and 2 tsp oil. 3. Knead to a soft pliable dough. Do not add any other liquid. 4. Cover and set in the refrigerator overnight. 5. Knead slightly and make small lemon size balls. 6. Roll it to 3-4" discs thicker than puris. 8. Turn and fry both sides till golden brown color. Chili is a spicy soup with tomato beans and seasonings. I tried making this dish with beans, corn, vegetables and Indian spices/seasonings and finally garnished with a dash of whipping cream. The finished dish tasted amazing. 1. Take 4 tbsp olive oil in a pan and add asafoetida, turmeric, mustard seeds and whole jeera. When it starts crackling add crushed garlic, cumin powder, methi seeds, ginger grated and chopped onions. 2. Sauté the onions till brown. Add the chopped tomatoes and cook till it is soft. 3. Add the cooked kidney beans, sprouted moong dhal, black beans and fresh/frozen sweet corn. 4. Set in the slow cooker for 4 to 5 hours in low. 5. In the meantime add the remaining olive oil to the chopped zucchini, red bell pepper, green bell pepper and bake in the oven for 30 minutes. 6. Add the coriander powder, garam masala powder, chilli powder, salt to taste to the chili in the slow cooker. 8. Just before serving add the roasted vegetables and garnish with whipping cream. 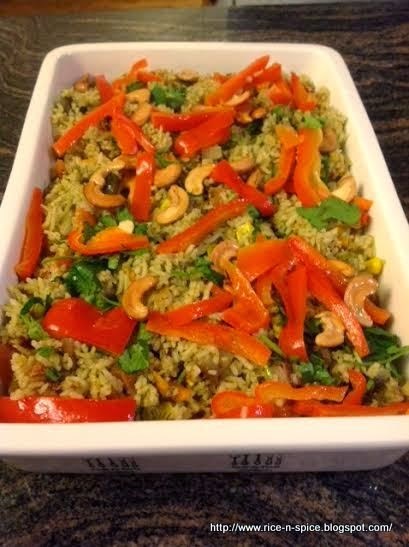 The Indian Cooking Challenge for February is a spicy vegetable biryani which is a speciality from Tamil Nadu. This recipe is adapted from Chettinad recipes but tailored to my taste. This biryani is traditionally made with jeera samba rice but I used basmati rice. Method:1, Take 2 tbsp oil in a pan and saute bay leaves, cinnamon, cardamom, cloves, marati moggu, star anise and set aside. 2. Fry cashew nuts till golden brown and set aside for garnishing. 4, Finally add the chopped tomatoes, turmeric powder, coriander powder,red chillli powder and salt. 5. Add water about 2 and half cups and let it boil. Stir in the rice and vegetables and cook covered or in rice cooker. 6. Add ghee and garnish with cashew nuts and red bell pepper. 7. Serve with tomato and onion raita. Idly is a traditional South Indian breakfast. 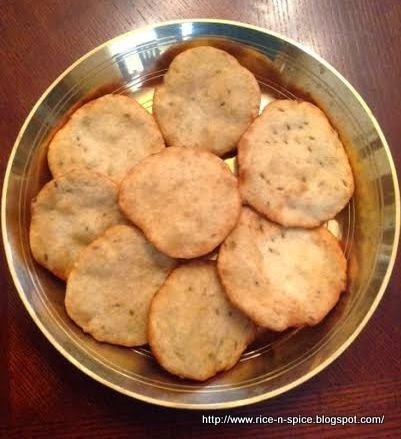 For Kanchipuram idly the batter is seasoned with spices, corriander leaves, curry leaves, ginger and tastes delicious. 1. Soak rice and urad dhal separately for 5 to 6 hours. 2. Grind urad dhal till soft and fluffy and rice a little coarse. 3. Mix both the batters and set aside to ferment overnight. 4. When ready to make the idlys add half cup of yogurt add salt to taste. 5. Add soaked channa dhal, chopped fresh coconut pieces, green chillies, corriander leaves and grated ginger to the dough. 6. Make a seasoning with 2 tsp ghee and add asafoetida, cumin seeds, curry leaves, black pepper, cashewnuts. 7. Add the seasoning to the batter. 8. Pour the batter in idly moulds or plates and steam it for about 15 minutes. 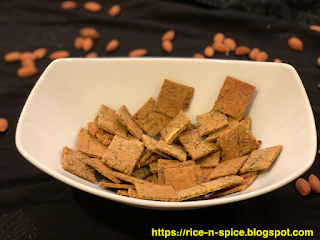 Kaju Katli is an Indian dessert which means cashew fudge. This dessert is made traditionally during Diwali. Ghee/unsalted butter - 2 tbsp. 1. Blend cashew nuts with just enough milk to blend. 2. Put the blend mixture and sugar in an anodized or non stick pan and cook. 3. Keep stirring continuously with a wooden ladle for about 25 to 30 minutes. 4. The mixture will start leaving the pan and form a ball. 5. Add the ghee/unsalted butter and stir it. 6. Keep a greased cookie sheet or plate ready. 7. Spread the mixture on the greased sheet and roll it. 8. Cut to desired shapes and sizs. The Indian Cooking Challenge for August is Badusha. This is also called Balushahi in North India. This dessert is prepared during Diwali festival and Durga Pooja. This dessert is made of all purpose flour and deep fried and then dipped in sugar syrup. 1. In a wide bowl mix the flour, baking soda and baking powder. 2. Add butter mix and the it should be crumbly. 3. Now add the curds slowly as needed making into soft dough. Do not knead the dough. 4. Cover the dough with a damp cloth and let it sit for about half an hour. 5. Take the dough and knead just enough to hold it together. 1. In a wide sauce pan add water, sugar medium heat, bring it to a boil. 2. Let it simmer until syrup is almost to one thread. Add the cardamom powder and set it aside. 3. This can be done just before making the Badusha during the half hour resting period. 2. Make the dough balls, flatten it down on your palm, make a deep dent in the center of the ball. 3. Heat the oil in a Kadai, and keep the flame on low heat. 4. The oil should be hot, but not smoking hot at the same time. 5. Check for right heat by dropping in a tiny dough. 6. When the oil sizzles, you can gently drop in the balls. 7. Fry in batches and turn over and cook till it browns. The balls should be golden brown on both sides. 8. Once done, drain on to a kitchen towel, and keep it for few mins. 9. Dip the fried balls in the sugar syrup and remove them right away. Do not leave them in the syrup. 10. Garnish with chopped pistas and serve hot. Kootu is a Tamil word which means"add". Vegetables and lentils are combined with spices and the consistency is thicker. 1. 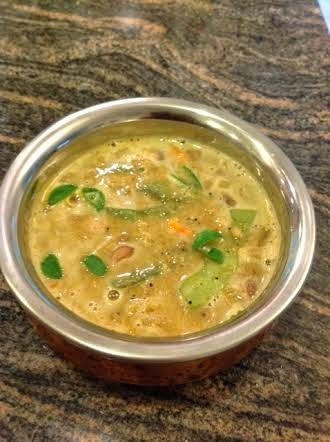 Roast urad dhal, red chilies, black pepper, poppy seeds, curry leaves and blend with dry coconut and set aside. 2. Pressure cook toor dhal and peanuts. 4. Add blend mixture to the cooked toor dhal and peanuts and add vegetables. 5. Add salt to taste and boil. 6. Finally make a seasoning of mustard seeds, asafoetida and curry leaves and pour on the kootu. 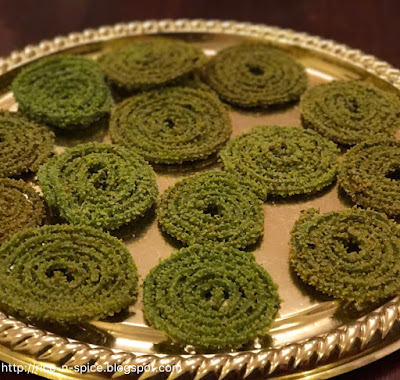 The Indian Cooking Challenge for June is classic traditional snack, the famous Murukku. These murukkus are from a town down Tamil Nadu called Manapparai. The recipe source is from "The Hindu" newspaper. This murukku has a unique taste as the water in Manapparai is uniformly salty and gives the murukku its distinctive flavor. 1. Mix all ingredients with rice flour and urad dhal flour. 2. Add water little by little, kneading into a thick batter. 4. Fry in medium heat till crisp. 5. Store in airtight containers. 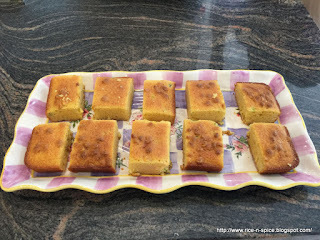 The Indian cooking challenge for March is Mohanthal is a Gujarathi dessert. This is made with roasted besan flour, ghee, and sugar. It is sweetened gram flour fudge. 1. Sieve the flour in a bowl and mix with ghee and rub well with hands. 2. Slowly add the milk and keep it covered for 20 mins. 3. In a pan, take half. A cup of water and sugar. Make one thread syrup and add half of the chopped nuts. Remove and keep it aside. 4. Heat a heavy bottom pan. Add the remaining ghee, flour and mawa. Keep stirring till you get a roasted aroma from the flour. Now add the mawa and mix well. 5. After the mixture is combined well, add the sugar syrup and cook for about 6 - 7 mins. 6. When the mixture leaves the sides, it is ready to be removed. Pour this on the greased plate. Sprinkle chopped nuts over it and cut into small serving pieces. Inspired by Sanjeev Kapoor's recipe tailored to my taste. 3. Add salt, pepper and lemon juice. 4. Add salt to the boiled and cubed beets. 5. 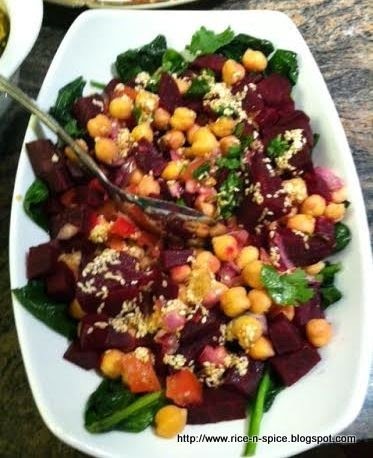 Before serving arrange the spinach leaves and lightly mix the beets with chickpeas, onion, tomato mixture. 6. Toast the sesame seeds in a tsp of olive oil and mix. 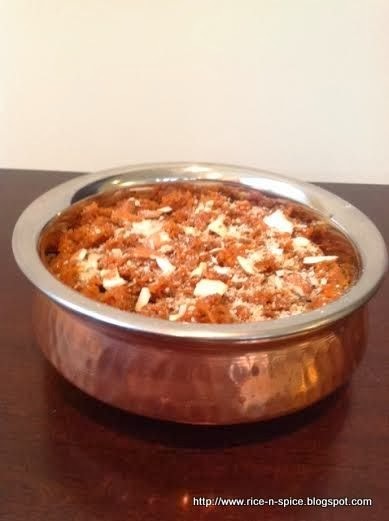 Gajar Halwa is also known as Carrot Halwa is a famous dessert in India. It is made by placing grated carrot in a pot with, milk, sugar, ghee and then cooking while stirring regularly. It is served with a garnish of desired nuts. 2. Add the grated ashkin to evaporated milk and cook till it is condensed. Alternatively, use slow cooker for this step. 3. After the milk is condensed add sugar to the cooked carrots, saffron, cardamom, borneal and ghee. 4. Cook till all the ghee is absorbed. 5. Garnish with sliced cashew nuts. Za'atar a Middle Eastern spice made from the dried herbs, mixed with sesame seeds, dried sumac, and often salt, as well as other spices. Used in Arab cuisine, both the herb and spice mixture are popular throughout the Middle East. Having tried this spice on flat bread in Mediterranean Bakery I wanted to try making bread with this. 1. Make sure the milk, butter, yeast are all at room temperature. 2. Disintegrate the yeast in a tsp of sugar with luke warm water. 3. Mix the bread flour in skim milk, disintegrated yeast, salt, butter and olive oil. This can be done either by kneading by hand/ or in the kitchen aid mixer/food processor/bread machine dough cycle. 4. Cover the dough with oiled plastic wrap and set in a warm place for a few hours till it is double in size. 5. Punch the dough and place of a lightly floured surface. 6. Roll the dough about 3/4 inch thick and cover with oiled plastic wrap. 7. Take the mixture of zaatar spice mixed in olive oil and spread it over the dough. Leave a border of 1/2 inch. 8. Roll up the dough and tuck the ends and place in a prepared bread pan. 9. Cover with a plastic wrap and set aside in a warm place to rise for 45 minutes or until the dough has risen more than double in size. 10. Preheat the oven to 425F. 11. Remove the plastic wrap and brush the top with olive oil and make light cuts on top with a knife. 12. Bake for 25 -30 minutes till the bread is golden. 13. Cool before slicing the bread. Idli is a very popular South Indian breakfast dish. This recipe is a twist to the regular idli and is tempered with spices. 1. Make 4 plates of mini idlis in the steamer or cut the regular idlis to cubes. 2. Take out of the mould and cool it completely. 3. Heat oil in a pan and add olive oil, asafoetida, mustard seeds, cumin seeds. When the mustard seeds crackle add the urad dhal, curry leaves, crushed black pepper, red chilli and cashew nuts. Saute. 4. Add the cooled idlis to the pan and toss gently. 5. Finally add the chutney powder and mix. Adjust salt if necessary. 6. Add the lemon juice and garnish with chopped cilantro leaves. Dosa is a common breakfast dish. Though dosa typically refers to the version made with rice and lentils, many other versions exist, often specific to an Indian region.This dosa is typical to South Kanara region. 2. 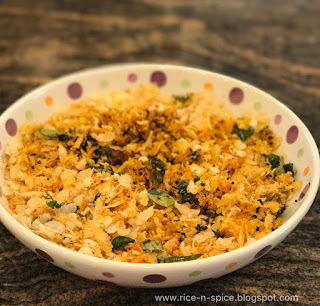 Blend rice with fresh or frozen grated coconut, red chillies, cumin seeds, jaggery or brown sugar, tamarind, and salt. 4. Spread a tsp of oil on the skillet and arrange the sliced ridge gourd. 5. Pour the dosa batter on the skillet and spread evenly. 6. Keep the heat medium to high. 7. Put another tsp of oil to cook, cover the skillet. 8. Flip the dosa and cook on the other side. 9. Serve dosa with or without chutney.